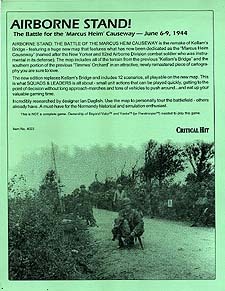 Airborne Stand: The Battle of the Marcus Heim Causeway is the remake of Kellam's Bridge - featuring a huge new map that features what has now been dedicated as the"Marcus Heim Causeway" (named after the new Yorker and 82nd Airborne Division combat soldier who was instrumental in its defence). The map includes all of the terrain from the previous "Kellam's Bridge" and the southern portion of the previous "Timmes' Orchard" in an attractive, newly remastered piece of cartography you are sure to love. The new edition replaces Kellam's Bridge and includes 12 scenarios, all playable on the new map. This is what Squads & Leaders is all about - small unit actions that can be played quickly, getting to the point of decision without long approach-marches and tons of vehicles to push around... and eat up your valuable gaming time. Incredibly researched by designer Ian Daglish. Use the map to personally tour the battlefield - others already have. A must-have for the Normandy historical and simulation enthusiast. This is NOT a complete game. Ownership of Beyond Valour and Yanks (or Paratrooper) needed to play this game.